The world’s most expensive defender had a night to remember as his side got the better of Everton. Wayne Rooney proved a little too enthusiastic in his early challenge on Joe Gomez as his mistimed attempt to win the ball back following a poor touch earned the former England striker a yellow card. With Mohamed Salah sidelined for a home side featuring six changes and no Philippe Coutinho, Sadio Mane had the chance to step out from the shadow of the man who beat him to the African Footballer of the Year award, but shot well wide of the target from 25 yards. The hosts had to defend doggedly to shut down a promising attack for Everton in the 24th minute, with Van Dijk playing his part to thwart them before Milner side-footed a volley wide of the far post at the other end. Lallana tried to turn in the box but took a tumble under close attention from Holgate, with Milner coolly converting from 12 yards. Controversy stirred just before the break as Firmino and Holgate clashed after the Brazilian was pushed into the crowd by his opponent, with the two squaring up amid ugly scenes. An out-of-sorts Rooney was replaced early in the second half by the young Ademola Lookman as Allardyce sought a route back into the contest, though his side could have fallen 2-0 behind soon after when Gomez badly miscued a straightforward back-post header. Everton came close to capitalising on that let-off as Sigurdsson’s swinging free-kick caused problems for a nervy Loris Karius, with the Reds ultimately escaping unharmed. The headlines looked to have been written when Van Dijk climbed to meet Alex Oxlade-Chamberlain’s excellent cross, only to direct his header at Jordan Pickford. And Liverpool fell victim to a sucker-punch when Sigurdsson brilliantly stroked home at the end of a rapid counter-attack led by Lookman. Van Dijk, though, insisted on being the centre of attention and nodded in Oxlade-Chamberlain’s late corner to spark jubilant celebrations. 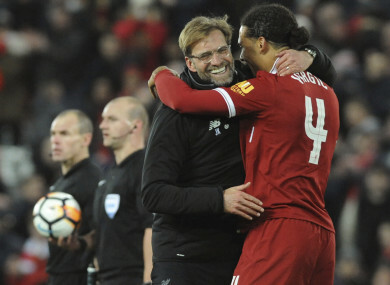 Email “A dream Liverpool debut for Van Dijk as he nets late Merseyside derby winner in front of the Kop ”. Feedback on “A dream Liverpool debut for Van Dijk as he nets late Merseyside derby winner in front of the Kop ”.